This driveway is obviously designed for maximum convenience and efficiency for vehiclular traffic. The result is that vehicles travel at higher speeds while entering and leaving, while pedestrians must cross a very wide open space. The driveway median, which could provide a refuge for pedestrians midway, has no curb cuts, so it is not easily accessible. There is no marked crosswalk. 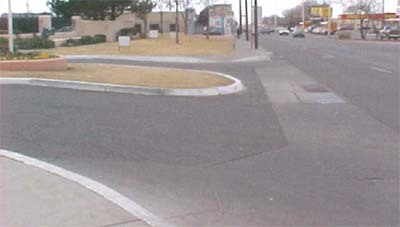 A better design would reduce conflict between pedestrians and vehicles by reducing the turning radius, narrowing the entry and exit lanes, and making the median strip more accessible. Another example of a wide driveway appears in the page "Wide crossing due to over-generous corner turning radius".